Milkdot's new backpacks plus new colours for Stoh Lunch Totes! Milkdot’s new backpacks plus new colours for Stoh Lunch Totes! If ever there was a fashion-forward backpack, then this just has to be it! 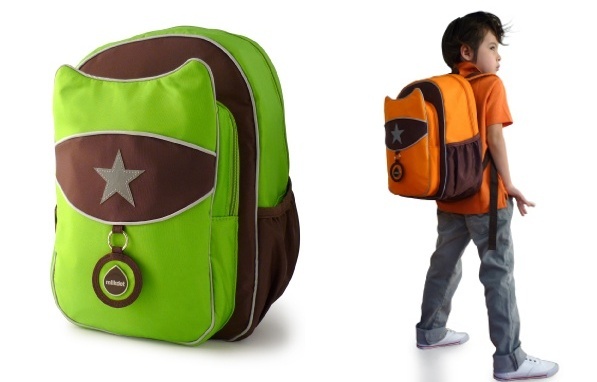 Milkdot has seriously upped the ante in fashionable backpacks with its latest release. Lucky kiddies all over the world will soon be treated to the fabulousness that is the Milkdot Top Kat Backpack. The appeal lies with its vaguely superhero lines – almost Batman or another masked crusader, yet subtle enough and most definitely not licensed! The kid up there in the photo has cool covered, carrying around a backpack made with safe materials. It’s PVC and BPA-free and tested leadsafe. The star on the front is reflective and the bag comes with an ID tag. Available in tangerine and chocolate or lime and chocolate, it will be available soon. Milkdot’s much coveted Lunch Totes now come in three new flavours. Tangerine, lime and candy apple red are all combined with chocolate to make the three most delicious totes imaginable. We featured the pink and blue versions here in July 2009. Red Chilli Designs have just released the new colours of lunch totes for $48 and are expecting the backpacks soon.